We did it!! The Special Olympics State games here in Mt. Pleasant, MI were a success in my book. 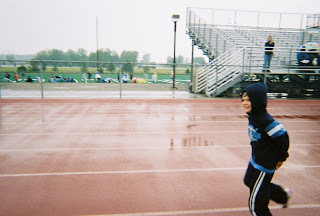 For his first race (above) my son stayed in his lane and finished the race with a big smile. There's my little athlete running his race while trying to keep his pants up. Everyone was cheering him on. He was last in his heat, but he received a bronze medal because there were only three runners. I am happy and relieved. We've come a long way since the season began in terms of sportsmanship and track skills (see links to previous posts for details). He also has a silver medal and a fourth place ribbon from the 2008 summer Olympics. Pictures: First we have Thomas the Tank Engine and then we have Lil' Critter on the cover on one of the Mercer Meyer Books. Which character do you think would win in terms of Sportsmanship? Would it be Little Critter? Or would it be Thomas the Train? Based on the book Just a Baseball Game, I'd say Little Critter. 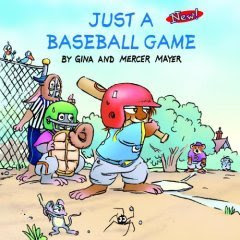 In that book, the first-time little leaguer's team plays The Dinosaurs, a team of players who are much bigger than Lil Critter and his friends. As a result The Dinosaurs run up the score. The team members of The Critters start to feel bad until their coach reminds them that they should just have fun. The message here is that playing is more important than winning. It's a lesson I'd wish my son would learn. "I am first and you are last!" It's my son's favorite quote to spout from the book. He'll say this before every race during Special Olympic track practice where he races teammates that are much bigger and stronger than he is. The guys he races also have more experience in track as my guy is the youngest on the team and a first-year team member. Me: (sigh) "Be a good sport!! Don't yell at your team mates!" For Creative Corner Saturdays I am hoping to go beyond my own family and feature the artwork and poems of individuals with ASD or their family members. Today I am featuring artwork that should make everyone smile. 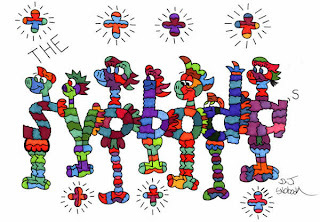 The colorful, quirky Imagifriends are from Imagiville where everyone is nice to each other. The creator of Imagifriends is D.J. Dvoboda, a 24-year-old man with autism. The artists sells mugs, mouse pads, canvas bags and a fifteen-page coloring book. He also is hoping to create signs or murals with names (as seen above), for individuals and businesses. "My name is D.J. Svoboda. I am the creator of the Imagifriends of Imagiville. The Imagifriends of Imagiville are based on the experiences I have faced during times at school. There were days at school when I was made fun of, and when I was picked on and treated mean. Those made me feel very sad and hurt. That is how I got the idea of the Imagfriends of Imagiville...D.J." My thoughts: The artist also has free coloring pages on his site that can be printed out at home. He encourages children to write stories about his characters. I am thinking about sending the website address for Imagifriends to the director of my son's summer arts camp. I can see the campers there coloring his pictures and maybe even writing stories about them. I can also see parents who of home school their children, particularly children with special needs, using D.J. 's artwork in their curriculum. I love that the artist was inspired by his not-so-great social experiences to create something so positive. We are back in Mt. Pleasant now after being in Northwest Ohio for the last six days. My nine-year-old son with ASD went back to school today and my husband went back for a half-day of work at Central Michigan University where they are between Spring and Summer sessions. My son has two back-to-back activities after school today. He has Special Olympic track practice from 4:15 to 5:30 and will ride a horse in his Proud Equestrian Program (PEP) beginning at 6:45. Thankfully Thursdays is the only day with two activities. It might be difficult for my guy to get through both activities tonight because we arrived at home around 10 p.m. last night. My child will be exhausted. My big concern is how school will go tomorrow. It's hard enough for a neuro-typical person to control behavior when exhausted. Hopefully my young son with ASD will be able to manage. As tiring as those activities seem, going back today is a necessity. There's something comfortable about returning to one's routine. Our hope is that our life will be somewhat 'normal' for awhile. I am hoping to get back to weekly themes here at this blog soon. I keep thinking that will happen and then something comes up. Hopefully, I'll get rolling with a theme on Monday. As for me personally, I'm tired with an unshakable headache. I'm slowly unpacking and cleaning up the house as I keep an eye on my five year old son who has been watching way too much television today. However, I'm fortunate to have caring friends and family. We've received several cards and emails expressing sympathy for the loss of my dad. I've appreciated all the support. This coming year won't be easy, but I'll manage. Take Care--jml.